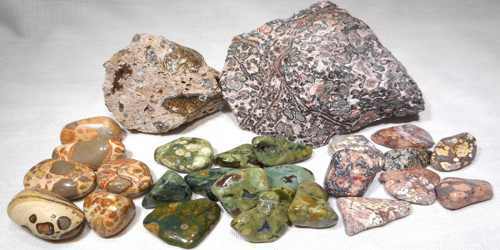 Rhyolite is a usually light-colored, fine-grained extrusive igneous rock that is compositionally similar to granite. It often includes flow lines formed during the extrusion. Due to the high silica content, rhyolite lava is very viscous. It may have any texture from glassy to aphanitic to porphyritic. The mineral assemblage is usually quartz, sanidine and plagioclase. Biotite and hornblende are common accessory minerals. Many rhyolites form from granitic magma that has partially cooled in the subsurface. When these magmas erupt, a rock with two grain sizes can form. The large crystals that formed beneath the surface are called phenocrysts, and the small crystals formed at the surface are called groundmass. It contains less than 5% phenocrysts, or mineral grains visible without magnification. 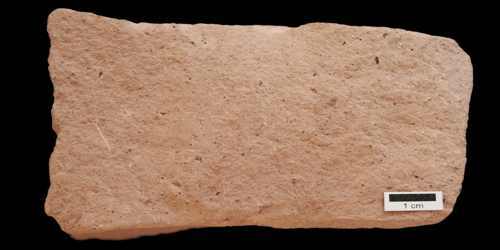 The rest of the more than 95% of the rock consists of a ground mass too fine to discern without magnification. This texture is the result of the rapid cooling of extruded lava, which does not allow sufficient time for larger crystals to grow. The mineralogical composition of rhyolite is defined as containing mostly quartz and feldspar with a total silica content of more than 68%. Quartz in rhyolite may be as low as 10% but is usually present in amounts of 25% to 30%. Feldspars often comprise 50% to 70% of rhyolite, with potassium feldspar present in at least twice the amount of plagioclase feldspar. Ferromagnesian, or dark, minerals are rare as phenocrysts, being mostly biotite when present. Trace accessory minerals may also include muscovite, pyroxenes, amphiboles, and oxides. Eruptions of granitic magma are rare. Since 1900 only three are known to have occurred. These were at St. Andrew Strait Volcano in Papua New Guinea, Novarupta Volcano in Alaska, and Chaiten Volcano in Chile. Rhyolite can be considered as the extrusive equivalent to the plutonic granite rock, and consequently, outcrops of rhyolite may bear a resemblance to granite. Granitic magmas are rich in silica and often contain up to several percent gas by weight. As these magmas cool, the silica starts to connect into complex molecules. This gives the magma a high viscosity and causes it to move very sluggishly. Granitic magmas have produced some of the most explosive volcanic eruptions in Earth’s history. Examples include Yellowstone in Wyoming, Long Valley in California, and Valles in New Mexico. The sites of their eruption are often marked by large calderas. They also occur as breccias or in volcanic plugs and dikes. Rhyolites that cool too quickly to grow crystals form a natural glass or vitrophyre, also called obsidian. Slower cooling forms microscopic crystals in the lava and results in textures such as flow foliations, spherulitic, nodular, and lithophysal structures. Some rhyolite is highly vesicular pumice. Many eruptions of rhyolite are highly explosive and the deposits may consist of fallout tephra/tuff or of ignimbrites. The chemical composition of rhyolite is very like that of granite. This equivalence implies that at least some and probably most granites are of magmatic origin. The phenocrysts of rhyolite may include quartz, alkali feldspar, oligoclase feldspar, biotite, amphibole, or pyroxene. If an alkali pyroxene or alkali amphibole is the principal dark mineral, oligoclase will be rare or absent, and the feldspar phenocrysts will consist largely or entirely of alkali feldspar; rocks of this sort are called pantellerite. If both oligoclase and alkali feldspar are prominent among the phenocrysts, the dominant dark silicate will be biotite, and neither amphibole nor pyroxene, if present, will be of an alkaline variety; such lavas are the quartz porphyries or “true” rhyolites of most classifications. Many gem deposits are hosted in rhyolite. 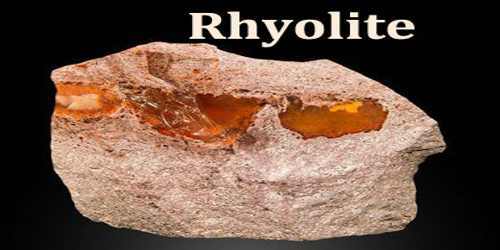 Rhyolite is a rock that is rarely used in construction or manufacturing. It is often vuggy or highly fractured. Its composition is variable. When better materials are not locally available, rhyolite is sometimes used to produce crushed stone. 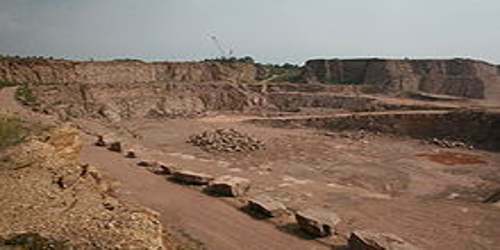 People have also used rhyolite to manufacture stone tools, particularly scrapers, blades, and projectile points. It was probably not their material of choice, but a material used out of necessity. It can be used as aggregate, fill etc. in the construction and roading industries. What is the Party Agenda?